Remember our post about the amazing salad dressing we tried HERE? Well, I tried two more flavors and they were AMAZING! Brianna's Salad Dressing is a company based out of Brenham, TX, but they are available in many supermarkets and stores across the nation. They have won many awards and have appeared in several magazines! 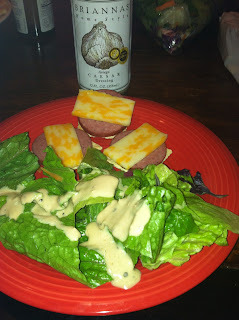 The Cesar dressing has a delicious Asiago Cheese, and it is the best Cesar dressing I have ever had! We also tried the Saucy Ginger Mandarin. It had a very Asian taste to it, and was perfect on salad. We hope to try it on sushi soon! My husband tried it as well, and said the taste was a good mix of both sweet and spicy. 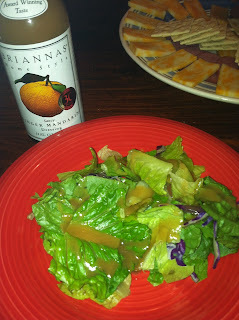 We enjoyed reviewing Brianna's Salad Dressing, and will be buying more in the very near future! MamaBreak received Brianna's Salad Dressings for free to review here on MamaBreak. MamaBreak was not compensated in any other way for this review. As always, our experiences and opinions are our own. I have tried that brand of dressing before & love it! Oooooo I would love to try the Cesar dressing!! They sound so good! We eat a lot of salads.. Can't wait to try! They really do have very tasty salad dressings. I have not tried the Saucy Ginger Mandarin. Thanks for the review! Yum yum yum! Love their dressings!